MEDALLION: Celadon color new jade medallion etched with spiraling rays. ACCENTS: Rock quartz crystal bead carved with the ancient Chinese Shou for long life and smooth quartz ellipses. COMMENTS: There are times in life when we hit energy lows. 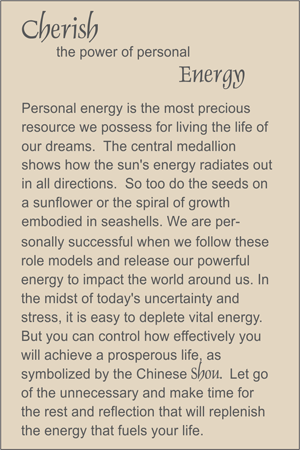 Focus on energy with this bead and you will find it.